Recently I stopped by a music store in town to buy banjo strings. I hadn’t been in the store for at least ten years. I remembered it as a hive of kids and grown-ups trying out guitars, pianos, and clarinets, browsing through racks of sheet music and instruction books, going in and out of the back rooms for lessons. This time, it was almost empty—partly the result of the guitar mega-store that had opened on the highway. The owner himself had also changed. He had slowed, gained a tremor, and lost the steadiness of his speech. The change in him, along with the decline in his business, shook me. I realized that I had expected during those years that he and the store had remained as bustling as they once were, immune from time. As I left I wondered what the music man’s recent life had felt like. What had been the satisfaction, the worth of it all, as he became ill and his business dropped off? In life, did aspiration and effort always lose out this way to decay? But such sympathy comes with risks. It can distort our picture of another person, or a group. I knew almost nothing about the music man or his life. For years he had been teaching music to people of all ages, a legacy to be proud of—though whether he was or not I didn’t know. And he had music itself as a source of joy, presumably. Compassion can overgeneralize. Perhaps I was unaware of the ordinary satisfactions that sustained him. The music man flies up to a happy ever after. Still, I couldn’t put down the question that the music man had handed me: what is the value, the worth, of our lives if they always end in decline? Our inner voice tells us that we matter. Do we? We may have our protective attitudes; I certainly have mine. But these can be rocked when we come face to face with a man or woman who has weakened from disease or the passage of time. There is another “Music Man.” The 1950s stage musical of that name describes a charming con man, Harold Hill, who arrives in an Iowa town to sell musical instruments and uniforms to the kids, promising he will teach them to play and will organize a band. Hill and the town librarian fall in love. She knows he is a fraud but keeps it to herself. Hill is finally exposed and is being put in handcuffs just as the instruments and uniforms arrive. The children appear in their uniforms, magically playing Beethoven and then the rousing finale of “Seventy-Six Trombones.” All ends well. 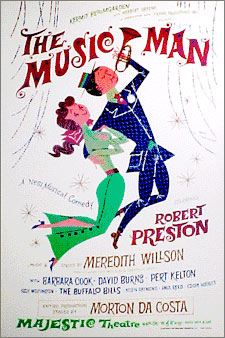 The poster for “The Music Man” shows the smiling couple flying skyward, arm in arm, Hill playing a trumpet. The musical is a romanticized Christian answer to the dilemma of frailty and decline. The sinner is redeemed by love, death is defeated by grace. But I prefer the lesson I learned in the music man’s store. This entry was posted in Dying, Religion and tagged change, love, music, struggle, suffering, time. Bookmark the permalink.